Forget the coffee this morning. Mix up a pitcher of Sangria. Then sit down and have a long look at this gorgeous Modern Mediterranean estate in Preston Hollow, designed by architect Larry E. Boerder. Although the Mediterranean architectural style has been popular since the 14th century, America only got around to fully embracing it in the 1920s. Better late than never. The ‘20s were a time of luxury, travel, and leisure for the upper classes. Enterprising businessmen took advantage of the economic boom and created the first resorts for the rich and famous, building them in coastal climates like California and Florida. They turned to the Mediterranean style because it captured the exotic and laid back ambiance of Italy and Spain. The Breakers in Palm Beach and The Miami-Biltmore in Coral Gables are classic examples. Naturally, this commercial popularity led to prominent architects like Addison Mizner in Florida and Bertram Goodhue in California adapting the style for residences. Mizner was one of the first architects to create grand resort-style Mediterranean estates for wealthy individuals. The Mediterranean style has been made even more desirable by magazines featuring Hollywood movie stars and their homes. From Jayne Mansfield, Marilyn Monroe, and Cary Grant, to Ellen Pompeo, Eddie Murphy, and Gloria Estefan, more stars than I can count have chosen to live in Mediterranean-style homes. It’s not just the look to love, but this style is also extraordinarily practical for warm climates. I recall hearing about this, but it didn’t resonate until I saw it in Bloomberg: Our Energy Transfer Partners, as in Kelcy Warren and his son Klyde, who has a downtown Dallas park named after him, now heads a dang big company that includes more pipeline than Larry Ellison has homes. Energy Transfer Partners has acquired Sunoco Inc. in a complex cash and shares deal. All I know is I grew up in Illinois and used to buy a whole lot of Sunoco gas, and they once had these green inflatable dinosaurs we all got for free — this when they were so nice to you at gas stations. I know I’m dating myself here, but once upon a time, boys and girls, gas stations gave great service for your business. They pumped gas and gave you big green plastic dinosaurs for your swimming pools. Anyhow, Energy Transfer now owns the place, old plastic dinosaurs and all. So what does this have to do with real estate? Kelcy might be shopping for more real estate. 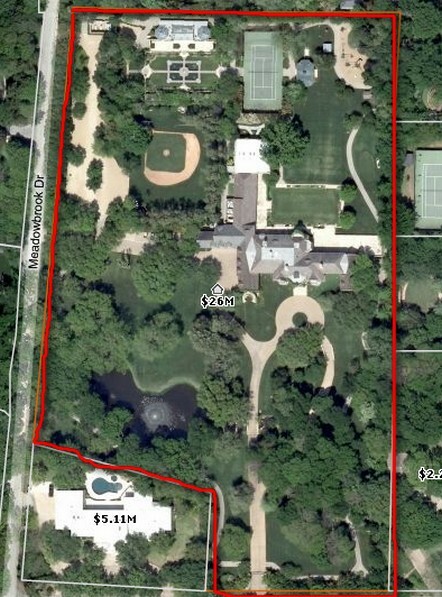 He already owns one of the most prestigious homes in Dallas, 26,620 square feet set on almost 9 acres of land in the honeypot of Old Preston Hollow. 5323 Park Lane was constructed circa 1991-1993 by a dream team including architect Cole Smith, Smith/Ekblad & Associates, Sherry Hayslip-Smith, Hayslip Design Associates and Cole Smith, Jr., Crowbar Contractors for Joyce and Larry Lacerte. At the time of sale, it contained a racquetball court, exercise room and locker rooms adjacent to a near Olympic-sized natatorium, bowling alley, wine cellar with tasting room, an Orangerie conservatory overlooking interlocking Koi ponds loaded with about a million dollars worth of Koi, tennis court, baseball diamond and a private lake. Dave Perry-Miller (Ebby Halliday) agent Ralph Randall represented the Lacerte family. Mr. Warren added a private, secret music studio hidden off a shoe rack in the spacious master closet. It is designed to be soundproof so he can practice away, and BTW that closet is the size of most apartments. 5323 Park Lane was originally listed in 2008 for $45 million, then lowered to just under $40 million as the nation’s real estate bubble went bust. According to my sources, it sold for about $29 million-ish, and sharp Kelsey even asked for an outside appraisal. (Imagine what he did to Sunoco!) His buyer’s agent was Rosie Waters of Allie Beth Allman and Associates, who is married to football legend Charlie Waters, who works for Mr. Warren. 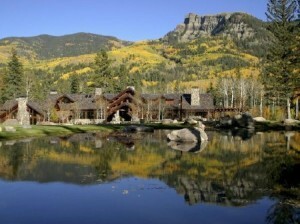 As if that isn’t enough, in 2010 Mr. Warren paid $46.5 million for a 3,500 acre ranch in Pagosa Springs, Colorado, near Telluride: Bootjack Ranch. 14,000 square feet, 27 bedrooms, 29 bathrooms, four half baths, according to Sotheby’s. But that’s not all. It has miles of river — great fishing — lakes and an 82-foot long pool, a 12,000 square foot glass lodge spa and aquatic center complete with retractable roof for “spa activities.” (Gotta have fresh air for yoga, right?). The dining room light-fixture is in the shape of a canoe. All together, there are 77,000 square feet of interiors, plenty of room to entertain 50 or an army. Mr. Warren also owns an entire island off the coast of Roatan, Honduras where he is building an amazing private retreat. And he’s a great negotiator: Bootjack ranch, which was owned by a San Francisco Bay-area developer and his wife, was originally listed for $88 million. We were lucky enough to fly by private jet to Crested Butte a few summers ago, and there was Mr. Warren’s private jet right there just waiting for him. Wine room; 14,000 square foot spa and aquatic center, below.